Pavillon des Poêles, Château, Fontainebleau. The Grande Salle, as it is called in one document referring to its decoration during Rosso’s lifetime (see below), was situated on the first floor of the Pavillon des Poêles (L.42) behind the terrace that was supported by the arches of the Galerie Basse. If this room occupied the entire floor, which is likely given that it was called “grande,” then its dimensions were about 19.3 by 8.8 meters. From the exterior views of the Pavillon des Poêles by Du Cerceau (Fig.Du Cerceau Print, Gallery), the Grande Salle would seem also to have been about the same height as the Salle Haute, approximately 6 meters. In the 1550s the room was divided into two, which received entirely new decoration. It was at this time under Henri II that the small cabinet by Philibert de l’Orme was added at the east end of the terrace, as seen in Du Cerceau’s prints.1 It is, however, easy to see what the exterior of the first floor of the Pavillon des Poêles looked like without that small addition. The south façade had five bays, without arches, which were separated by pilasters set on plinths. Windows were fitted into the center three bays above sections of a low wall placed between the plinths. The end bays had doors – the one at the east is conjectured – that opened onto the terrace. 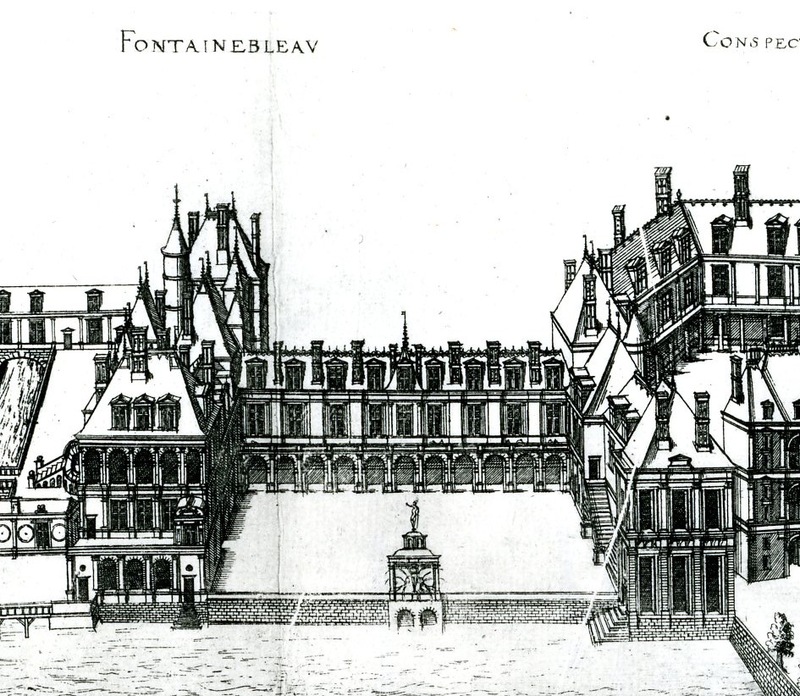 The east and west façades were divided by pilasters into three bays, with a window filling the center one (Fig.Du Cerceau Print, Cour de la Fontaine). Toward the west end of the north wall across from the second bay of the south side was the entrance from the stairway tower. In the matching position toward the east end of the north wall there would probably have been an entrance from the terrace running between the Pavillon des Poêles and the next pavilion to the north facing the Cour du Cheval Blanc. From the appearance of three of its façades and from what can be assumed about that of the north wall, one can have some idea of the interior wall areas of the Grande Salle des Poêles that would have received decoration. The ceiling would have been flat, made of wood, and probably coffered. The Grande Salle was heated by stoves that were its special feature and from which it was also called the “salle des poisles” (see below). It would have been here that Charles V stayed when he visited Fontainebleau at the end of December, 1539. If the “salles, chambres et galleries” mentioned in the Cronique refer only to rooms in the Pavillon des Poêles then they would include the Salle Haute (L.43) and the Galerie Basse (L.44). However, it is known that the decoration of neither of these was completed by the time of Charles V’s visit. In any case, it was the Grande Salle that was heated and it was here that the emperor would have stayed in December. It would have been decorated for this visit. Within the period of 1 January 1538 to 31 December 1540 there is a record of payments for stuccowork and painting in the “grande salle du pavillon naguerre fait de neuf près l’estang dudit lieu, où doivent estre mises les poësles dudit Sieur.”3 As this record immediately precedes another of payments for the festival decorations made for the emperor’s visit to Fontainebleau (see L.48), it is most likely that the stuccowork and painting were also done in preparation for Charles V’s arrival. Then, shortly after Primaticcio returned to Fontainebleau sometime after the end of October 1541, Claude Badouin [“Audit Badouyn, paintre”] was paid “pour avoir vacqué tant à la façon des patrons des tapisseries, que à la façon et [sic; read “de”] painture d’un tableau à frais en façon de tapisserie, contre la muraille, en la salle des poisles, au grand pavillon près l’estang dudit lieu, à raison de 20 liv. par mois,” and “A Jean Picart, doreur,” was paid “pour l’enrichissement d’un grand tableau à frais estant en laditte salle des poisles, entre les deux grands tableaux qui sont en façon de tapisserie, à raison de 16 liv. par mois.”4 What seems to be indicated in these few documents is that originally the Grande Salle was decorated in fresco and stucco and that later Badouin added at least two frescoes that imitated tapestries. Whether or not the large fresco that Picart “enriched” was new or not cannot be determined. It is possible that Badouin’s painted tapestries were replacements for actual ones that were part of the scheme of decoration that was prepared for Charles V’s visit. The Cronique makes a point of how quickly the decorations of the pavilion were made in anticipation of the emperor’s arrival. It also mentions the use of tapestries, as well as paintings and statues. All of these could have been part of the decoration of the Grande Salle. In fact, the use of already available tapestries – for certainly there would not have been time to weave tapestries for Charles V’s visit – would have made it possible to decorate this room more quickly than perhaps would have been the case if a series of large frescoes had to be executed. Of course, it could be that the decoration of the room was begun before it was known that the emperor would visit Fontainebleau. The plan of the decoration may then have been altered so that the room would be completely ready when Charles V arrived. The emblems of the emperor it received would have been temporary installations. 1 On these rooms and the small cabinet, see Dan, 1642, 128; Laborde, I, 1877, 283-285, 371; Dimier, 1898, 110-112; Dimier, 1925, 43-44; Roy, 1929, 247-249, 270-273; and Béguin, 1964, 93. 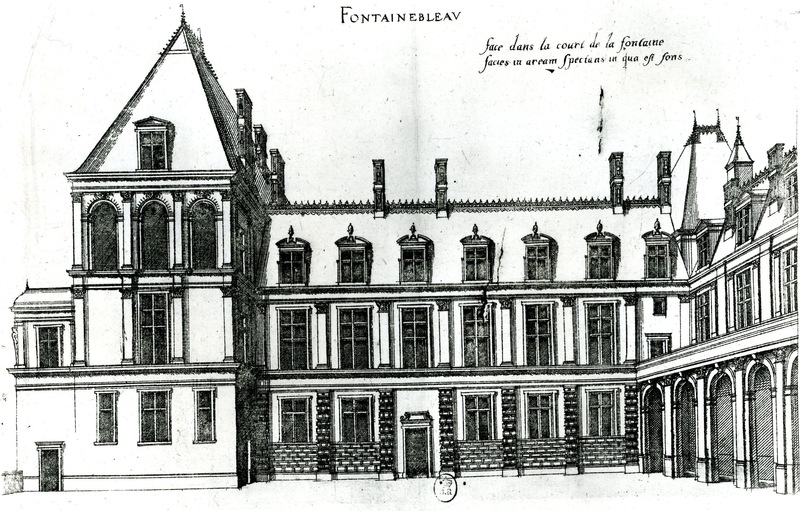 Claude Lauriol, in EdF, 1972, 482, and Fontainebleau, 1973, 154-155, stated that the original Grande Salle was divided into a “petite salle” and the “chambre du roi.” The documents and Dan refer only to the “chambre” and the added “cabinet,” but from Du Cerceau’s plans of the ground floor showing two square rooms, one larger than the other, and a corridor with a spiral staircase, it would appear that the first floor would have been similarly divided. Otherwise the staircase would have entered directly into the single large room, which is an unlikely arrangement. The coffered and sculpted ceiling of the king’s chamber removed to the Antichambre des Reines-Mères is square. 2 Guiffrey, Cronique, 1860, 290. See also Jacquot, 1975, 431, and n. 26 bis. 3 This document is transcribed under P.22. Dimier, 1898, 113; and 1900, 290 (referring to Laborde, I, 1877, 134), connected it to the Salle Haute (L.43), but documents specifically name that room as the “salle haulte” or the “grande salle haulte.” Thus, the designation “grande salle du pavillon” would seem to refer to another room in the Pavillon des Poêles, and that could only be the room on the first floor. Dimier says nothing of the decoration of this floor before the 1550s, although this is the one floor that had to have been completed before Charles V visited Fontainebleau. Herbet, 1937, 126, also thought this document refers to a room on the first floor. Roy, 1929, 246, mentioned the document and the “grande salle” but did not precisely identify this room. Mentioned in Carroll, 1987, 31, 35, n. 95. 5 Dimier, 1900, 51, thought the room was first decorated in this period.